Shifters Boxed Set out; Tiger Magic hits New York Times!! These don't have DRM, so you can probably convert to other formats as needed via Callibre (or some other conversion program). If you know readers who are interested but haven't tried these stories, let them know they're out there. And a big thanks to readers--Tiger Magic hit New York Times, USA Today, B&N Top 10; Amazon Top 100, All Romance Ebooks top 50, and various other lists out there! Woo!! You are amazing!! 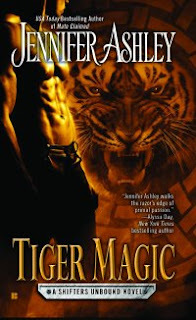 Tiger Magic is out Tuesday June 4! I know it's been seen in bookstores already, but the official date is June 4. :-) We move back to the Austin Shiftertown for this one! The contest below is now closed. Winners have been contacted. Thank you!! To celebrate, I'm giving away the 11 extra audio book CDs of Primal Bonds my publisher sent me. To win, just tell me in the comments why you want to win one, and leave your email address (you can disguise it if you wish). I hope you enjoy Tiger! He's one of my favorites. Many more Shifters to come. Check the Coming Soon page on my website, where I update with tites, release dates, and covers as soon as I have them.